We see the great, amazing person you are too afraid to show the rest of the world. We see the person who is too busy, feels under appreciated, feels over scheduled. We see the person who is afraid to take a break, in fear of being selfish. The person who sees all these "super parents" on social media and feels like an awful parent. We see the parents who give, give, give, give - to everyone EXCEPT themself. We see you asking how you can do and be more - without realizing the answer starts within. Yeah. We're talking about being selfish, for 1 hour a day, 6 hours a week. That's 6 hours out of a 168 hour week. Take care of YOU, do something for YOU. Refill your tank. 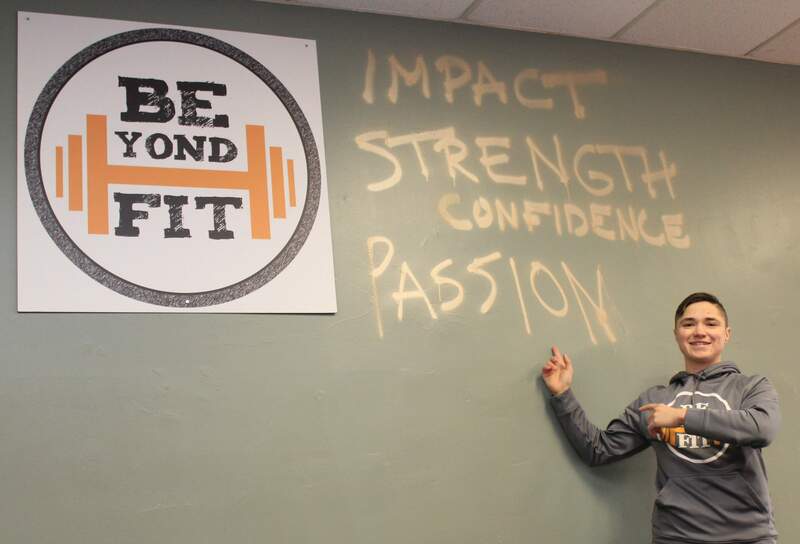 At Beyond Fit, our mission is to be the BEST part of our member’s day everyday! We train every client using science-based, functional movements. This type of training takes the body through natural movement patterns in an effort to strengthen the body for everyday activities and improve our client’s quality of life. We believe in the powerful connection between the mind and body. Through improved physical fitness and a growth mindset, you will break through your boundaries and achieve your full potential. area with the most attentive and knowledgeable staff, great members, equipment, and programs that set us apart from all other fitness businesses, and a club that is truly a clean and comfortable place to workout. Talk is cheap, however, and all owners in the area are equally proud of their businesses. Our club has been in business for 3 years and we understand that making a decision to commit to working out is difficult, and that picking the right club for you is even harder. Will I like the gym? Will I like the other members? Will I be able to get any help? These are all fair questions that can only be answered by trying our business before you become a member. One of the most important things we want you to know about our business is that we are solution based. This means there is only one really important question we need to ask you: What’s the single most important thing you want from your fitness experience? Based upon your answer, we will recommend a membership that best fits your needs. Think of us as your fitness resource, and if you know what you want to accomplish, we can help find a solution tailored just for you. Another thing that makes us unique is that we treat every member in this club the same every single day. If you have shopped other businesses in the area you will note that we are not the cheapest gym in town. We do this by choice. To us, poor service, uncleanly facilities, and lack of service all go hand-in-hand with being the cheapest price in town. You simply can’t be the best and the cheapest at the same time in any service business. If you appreciate quality and getting the results you deserve, then we are the right gym for you. If price is your deciding factor, our level of service and expertise may not be for you. Ty is the founder/owner of Beyond Fit. He has his B.S. degree is Exercise Science from IUP and is a certified Exercise Physiologist recognized by the American College of Sports Medicine. Ty's experience in Corporate Fitness and current role of owner/trainer at Beyond Fit has allowed him to help hundreds of people lose weight and get back to the ideal shape. No matter your level, Ty and Beyond Fit can help you achieve your goals! Mary's fitness journey started 3 years ago, she accomplished more in 3 years than most people do in a lifetime. She worked diligently towards achieving her goals, so she knows the true meaning of hard work and dedication. Since she has been able to push herself past limits she never dreamed of, she has become a huge source of inspiration and motivation within the community. Janet started at Beyond Fit 3 years ago! She has since started to run in 5k's, lifted weights, regained her freedom and lived a more fulfilled life! Now Janet is taking her journey to motivate others and change their lives as well. Janet has learned Beyond Fit and certified to coach our workouts. She is also super smart and self-educated! So expect her to add her own little, awesome tweaks in the program. Janet homeschools her 3 kids and runs a pretty legit garden out of her own yard, in addition to selling awesome Christmas Trees (which you should totally check out this winter).